Start with the exact diagram template you need to illustrate event then customize to fit your needs with hundreds of predefined shapes. You will find that creating diagram is simple and fun drawing process. View the featured presentations, charts, infographics and diagrams in the Event category. Free download event templates on professional diagram sharing community. 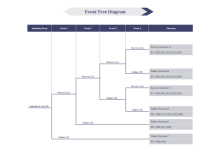 With Edraw, you can edit and print the free event diagram templates for personal and commercial use.